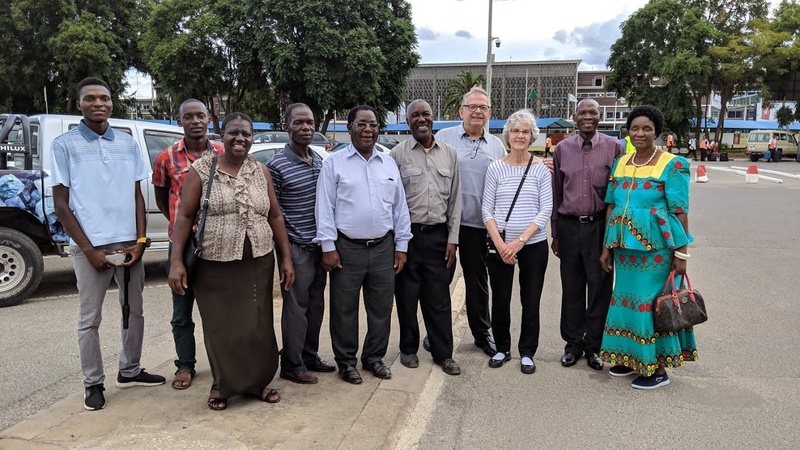 In this update from the president, Victor Kubik talks about his current visit in Zambia and the importance of preparing people to continue the work of the Church in the future. He then talks about how to preach the gospel through action as a 'living letter'. Arrival in Lusaka, Zambia, on April 7. From left: Mukambo Talama, Tatenda Phiri, Maureen Phiri and her husband Morris, Jonathan Litaba, Fred Mwaba, Victor and Beverly Kubik, Nawa and Felicia Talama. Pastor Derrick Pringle and his wife, Cherry, in the Copperbelt of Zambia, are hosting Beverly and me at this moment on our South Central African journey. We are visiting our ministry and congregations during this Holy Day season. We are making 9 stops in South Africa, Zambia and Malawi. Mabasa Chichaya, an elder from Zimbabwe, plans to meet with us in Blantyre, Malawi, towards the end of this journey—so we will have touched all four of these countries on this trip. “Now Judas and Silas, themselves being prophets also, exhorted and strengthened the brethren with many words. And after they had stayed there for a time, they were sent back with greetings from the brethren to the apostles… Then after some days Paul said to Barnabas, ‘Let us now go back and visit our brethren in every city where we have preached the word of the Lord, and see how they are doing’ ” (Acts 15:32-36 Acts 15:32-36 32 And Judas and Silas, being prophets also themselves, exhorted the brothers with many words, and confirmed them. 33 And after they had tarried there a space, they were let go in peace from the brothers to the apostles. 34 Notwithstanding it pleased Silas to abide there still. 35 Paul also and Barnabas continued in Antioch, teaching and preaching the word of the Lord, with many others also. 36 And some days after Paul said to Barnabas, Let us go again and visit our brothers in every city where we have preached the word of the LORD, and see how they do. We deeply appreciate our brethren in these countries and see their joy and love. But, behind that, there is the strain of living in difficult conditions politically and economically. Yet, God has called these faithful people and their leaders to serve Him. In the meetings we have held so far, I have been pleased to see the biblical knowledge exhibited by the questions they have asked. In Lusaka, Zambia, a few days ago, our Bible study went on for two and a half hours as we discussed the names and the nature of God, among other subjects. It is essential that we develop leaders who will carry on the work of the Church. The development in large part is education and training that we are already providing. They must be educated and grounded in our core beliefs and be able to explain them to others. They need instruction on caring skills in working with people. One example of such training was a multi-day seminar conducted right here in Kitwe by Darris and Debbie McNeely a few months back. The people here commented on how much this meant to them. We are committed to provide this vital service to various places in the world. You can follow our current journey in greater detail by following our TravelArk blog at http://v2.travelark.org/travel-blog/victorkubik/25 . In a divided world split painfully by extreme partisanship and a steady stream of discouraging, never-ending bad news, many call today for change. Many are simply tired of bad news. People increasingly reject a draining form of negative “entertainment” served up by sarcastic commentators. They want something different. You are possibly familiar with the popular TED talks, where leaders and experts have a maximum of 18 minutes to define and present a specific topic. Millions have seen these short discourses online. American King James Version×)—of the good news of the coming Kingdom of God! Indeed, in this darkening age, we “look not to the things that are seen , but to the things that are unseen ” (2 Corinthians 4:18 2 Corinthians 4:18While we look not at the things which are seen, but at the things which are not seen: for the things which are seen are temporal; but the things which are not seen are eternal. American King James Version×, English Standard Version, emphasis added throughout). Here’s an important question: what is the most powerful way to deliver these powerful and important truths? While various forms of electronic, print and digital communication platforms can reach millions, even billions of people, experts agree that the most powerful way to communicate is one-on-one, in-person communication. Communicating one to another one-on-one is the most memorable, the most powerful and the most effective way to communicate. And, according to experts, what’s the most common and noticed form of one-on-one interchanges? You might be surprised—it’s non-verbal communication. Upwards of 55% of all person-to-person communication occurs through body language: how we stand, how we appear, how we seem to be caring or non-caring through our facial expressions and posture. When you’re speaking with someone, do you ever get frustrated or discouraged when they break eye contact and seem to be interested in something else, simply “grunting” acknowledgement from time-to-time to act like they’re interested? Yes, body language plays an important role. But the most important type of effective and credible non-verbal communication is backing up our words with action ! When we do what we say, our words take on a new level of power. American King James Version×). The point? By their behavior and conduct, a disciple of Christ should have a reputation as a basic, fundamentally good person. That “salt” changes families, neighborhoods and even societies. Once we have achieved that, we then become, as Jesus taught, the very “light of the world” (verse 14). This is to be a major focus of our lives on earth, for as Jesus Himself instructs us, “let your light shine before others , so that they may see your good works and give glory to your Father who is in heaven” (Matthew 4:16 Matthew 4:16The people which sat in darkness saw great light; and to them which sat in the region and shadow of death light is sprung up. When our actions match our words, we are actively preaching the gospel of Jesus Christ! Here’s another very important reason why our actions are important. As I prepare this, I am traveling with my wife Beverly through southern parts of Africa. Why is this relevant? Because, in Zambia, just a little over 50% of the population can read or write. Of that figure, most are males. Many more females born and raised in Zambia cannot read. This tragic state of illiteracy exists in various states all over the continent. Many people in Africa cannot read the words that you are reading right now. We visited with a woman a few days ago and asked her how she spelled her name and to write it for us. She did not know and had to call for someone nearby to come and write it down for us. From the perspective of preaching the gospel, sending booklets, Bible study guides and printed Bibles to people who cannot read is nearly useless. This is not a new condition. Highly-literate countries like America, Japan and the countries of Europe are relatively new from a historical perspective. In the past, most people could not read or write at all . Depending on where you lived in the Roman Empire, in the first century, only 5-10% of the population could read. Fewer still could write! So that’s why you see phrases in the Bible like “he who has ears to hear” (e.g. Matthew 11:15 Matthew 11:15He that has ears to hear, let him hear. American King James Version×and Revelation 2:29 Revelation 2:29He that has an ear, let him hear what the Spirit said to the churches. American King James Version×). Early disciples and God-fearers went to synagogues because that’s where copies of the Bible (the Old Testament) were available and also—more importantly—where they could hear the Word of God being read ! Based on all of that, here is an important point that I invite you to consider deeply: in a world where religion is being challenged and generally disregarded, people increasingly choose to be illiterate when it comes to biblical knowledge. Major colleges openly teach that the Bible is a collection of stories, fables and philosophy, possessing no moral authority or relevance. Popular television shows mock biblical standards. Modern relativism—where people make up their own rules—is fast replacing biblical authority. How can this be countered? By you proclaiming the gospel through personal example . When you conduct yourself according to biblical teachings—observing the Sabbath, refraining from eating leavened bread while lunching with your co-workers, and especially when openly exhibiting the fruit of God’s Holy Spirit dwelling and working in you—”love, joy, peace, longsuffering, kindness, goodness, faithfulness, gentleness, self-control” (Galatians 5:22-23 Galatians 5:22-23 22 But the fruit of the Spirit is love, joy, peace, long-suffering, gentleness, goodness, faith, 23 Meekness, temperance: against such there is no law. American King James Version×)— you stand out! What’s the point? In a biblically illiterate world—whether by sad choice in first-world countries or by circumstance in third-world countries—your conduct becomes a living Bible to those around you! What was Paul’s approach? “I am not shamed of the gospel, for it is the power of God for salvation to everyone who believes” (Romans 1:16 Romans 1:16For I am not ashamed of the gospel of Christ: for it is the power of God to salvation to every one that believes; to the Jew first, and also to the Greek. American King James Version×, ESV). He told the Ephesian elders that the most important achievement of his life could be to openly “ testify [Greek transliteration diamarturomai , ‘to present solemn, credible evidence’] to the gospel of the grace of God” (Acts 20:24 Acts 20:24But none of these things move me, neither count I my life dear to myself, so that I might finish my course with joy, and the ministry, which I have received of the Lord Jesus, to testify the gospel of the grace of God. What about us? To what do our acts and actions testify? Are we living evidence of the truth in action? My most recent Forward column in the United News is about being a living letter , a real demonstration of God’s way of life through our personal conduct. I invite you to read and study it (and read it again—read the version in print or access it at https://www.ucg.org/members/united-news/is-your-life-a-living-letter ). We have a most important part to fulfill in the preaching of the gospel—a role of far more personal importance than that of giving a TED Talk. This Holy Day season and beyond, let our actions eloquently testify as living proof of biblical teachings. Living an authentic life that demonstrates biblical principles in action offers the most powerful message we can deliver. Let us tap the transforming power of the Holy Spirit to become more like our Elder Brother, fulfilling the very will of God! Your Zambian brothers and sisters in the faith greet you. Grace and peace from God the Father and Jesus Christ be with you all.